This site was intended as political satire and was not affiliated with any party or campaign. "A LAYMAN'S GUIDE TO THE SUPREME COURT DECISION IN BUSH V. GORE by Mark H. Levine, Attorney at Law. by Mark H. Levine, Attorney at Law. Nope. The five conservative justices clearly held (and all nine justices agreed) "that punch card balloting machines can produce an unfortunate number of ballots which are not punched in a clean, complete way by the voter." So there are legal votes that should be counted but can't be. Dead wrong. The US Supreme Court made clear that the Florida Supreme Court did not change the rules of the election. But the US Supreme Court found the failure of the Florida Court to change the rules was wrong. A: Justice Scalia said some of the counts may not be legal. While some have claimed that a legitimate count could have been performed, others argued that even an army of accountants wearing visors and reading round glasses could still have missed the actual numbers, since the organization of the results was so disorganized. Perhaps rose colored glasses, not round ones, were what was used, but none of that matters if the count is stopped before completed. 1,000 votes out of approximately 6,000,000 votes cast. In other words, Mr.
barely within the tolerance of the counting equipment. that are falling off are ones where the chad is already partially detached. treating the ballots with kid gloves, compared to the counting machines. the time when the largest number of partially attached chads will fall off. show and pose a question to congressman Sinunu (sp?). out, would you throw that dollar away?" The point is that we shouldn't be saying that votes were "counted"
legal votes just because the counting machines couldn't read them. usually Democrat Al Gore and a candidate other than Republican George W. Bush. 1,000 of the ballots had errors in races other than the presidential race. anybody who wanted to see them. percent of the votes were thrown out. botching the ballot by voting for more than one candidate. mention its chain is too short. with in what they described as "organised corruption". This one describes the experience of a Palm Beach County voter. Incredible! This one presents "13 myths" about the 2000 elections. Fascinating. situation feels so similar to Watergate! Actually, the recount issue is only half the story. of thousands of non-white voters to vote. Violations were so widespread that the election could be invalidated in court, according to the NAACP. officers demanded to see a "taxi license". enough staff to verify changes of address. pencils rather than pens when they voted, in violation of state law. (11/9/00). County-level results for Florida are at cnn.com. and televised on C-SPAN on 11/12/00. ABC News proves GOP behind protests in Miami Dade. Wednesday, demanding an end to the hand recount there. 's vote to end the hand recount. Protesters try to stop Miami recounts. be up there now counting," election supervisor David Leahy said. right of voters in Dade County. is a time to honor the rule of law, not surrender to the rule of the mob." manual recount is still going on. federal investigation of this attempt to stop a fair and accurate count." America he thought the protests were part of the democratic process. citizens are entitled to do that sort of thing," Olson said. campaign to call off the demonstrators. freedom from intimidation," he said. In Miami, they said they were there to help the media. to," one operative said when approached by ABCNEWS. color for local news reports. Washington, D.C., and New York. north wing of the courthouse. local sheriffs to keep order, Democrats said. Union, black leaders plan to battle GOP in courts over "Thug Tactics"
the civil rights movement 35 years ago. front of the Stephen C. Clark Center. workers' union leader and director of Unite for Dignity. "Our people plan to follow through in every legal way we can,"
with some kind of dinosaur-like actions." into stopping its vote recount. anti-Gore crowds for TV viewers. D-Miami. "It's very distasteful and I'm sorry it had to come to that." Meek, is the 34-year-old son of Miami's congresswoman. "We'll go by the rules and whatever they do, they do," he said. "But we know the race is not to the swift." Meek away for their own safety. never witnessed anything like that in my life." On Sunday, Sharpton got a rude sendoff in West Palm Beach. yelled, "We don't want you and your people around here." lunch before heading south to Miami. Miami-Dade -- and the governor Bush came out ahead. he gets results he likes. those impromptu manual recounts was a net 185-vote gain for Gov. George W.
while others undertook full, manual recounts. Wednesday after boisterous Republican protests. as "a mini hand count." belief that these votes have been counted." more errors than the OptiScan system. pretty clear and compelling argument." people across America are realizing, it already has." campaign is asking Miami to do, and Hughes' boss benefited. Republican Party operatives to correct 4,700 Republican absentee ballot applications so they would not be thrown out, court documents revealed yesterday. Goard conceded that no one was allowed to correct applications in the past and that her staff assisted the GOP representatives, who were not supervised while they worked, by sorting Republican applications from Democratic applications. The disclosures came through a lawsuit that, if successful, would throw out all of Seminole County's absentee ballots -- at least 15,000. 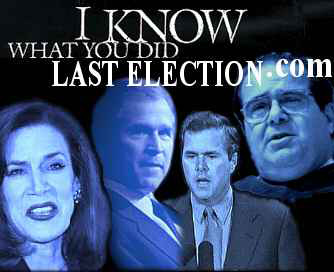 About two-thirds of those ballots were cast for George W. Bush. into question the legitimacy of Florida's presidential vote. The result in both counties was a windfall in a ratio of 2-1 for Texas Gov. requirements on voters who seek ballots in advance. ballot. It is a third-degree felony for unauthorized persons to intervene. themselves while arguing elsewhere that every vote must count. Bush point man Jim Baker has made much about the possibility of "mischief"
counties. No election could end in a worse way. Exact numbers that show why the exit poll that called the state for Gore was right. so few votes came up for Gore in recount. so-called undervote -- ballots where machines tallied no vote for president. George W. Bush argue that they're not votes at all. of the punch card ballot system." saying "none of the above." during a recent press conference. those using ballots read by optical scanners. scanners had an undervote of only .04 percent. and a half times as large. The difference, they suggest, is machine error. more than 1.5 percent -- a substantial disparity. the Democrats. "Is it because of the military issue that they seem to be afraid of? I don't know, but we say that you have to check them all if you check them." not quite as high as Palm Beach's 2.6 percent. official undervote of 1.6 percent. outcome of the long count for president. Excerpted from "Election 2000 Black politics takes center stage"
...While the media concentrated on the butterfly ballot in West Palm Beach and the fight over whether to recount the ballots, stories began to emerge about the systematic attempt to diminish the Black turnout. However, these offenses came under national scrutiny when the NAACP held hearings and heard testimony that , taken as a whole, amounts to a policy of systematic Black vote denial. These tactics included police roadblocks near voting precincts. Police stopped Black men demanding identification and issuing tickets for driving without a taxi license to get-out-the-vote workers driving car loads of people to vote. Election officials failed to pick up boxes of ballots severall Black precincts until Friday or Saturday following the election, they turned Blacks away from polls claiming they were not registered voters, they closed Black precincts early or ran out of ballots, they denied voting rights to students at Florida A&M University and Bethune-Cookman College. In addition, first time Haitian voters were not permitted translation assistance, a five minute voting limit was imposed and voters who made errors were illegally refused a second ballot. electors are actually on the ballot. argued about the definition of the word "is". Subject: FWD: Miami Herald Shows Gore Wins! or so would have gone to the minor candidates. flatly rejected [the analysis] as "hocus pocus"
votes to change the outcome of the election. marks weren't recorded by counting machines. "TOO LARGE A SHARE OF THE PIE." Awarding Bush Too Large a Share of the Pie." methodology and called it "overall reasonable." think tank, also found the numbers persuasive. extra votes, would come from Palm Beach alone. firm with tight Republican ties. it turns out none on the list were guilty of felonies, only misdemeanors. the list -- the state of Texas. may have been turned away at the polls. million contract with DBT Online, since merged into ChoicePoint, of Atlanta. felons can vote once their voting rights have been reinstated. In Florida, 93 percent of African Americans voted for the vice president. to vary wildly. Some found the list too unreliable and didn't use it at all. felony, she would not be allowed to vote. you must be a dummy." felon -- we mark an "f" for felon -- and the date that we received it,"
Rosado said. "They're still on our computer, but they're on purge status,"
meaning they have been marked ineligible to vote. "I don't think that it's up to us to tell them they're a convicted felon,"
person, they say 'Thank you' and walk away. They don't put up arguments." a result of being identified as felons. their rights restored and others were simply cases of mistaken identity. targeted for removal from voting rosters. percent of Hillsborough's voting population. purge. One supposed felon on the ChoicePoint list is a local judge. incapacitated with respect to voting." too late for the information to be processed. allowed to vote. They were given 30 days to respond if there was an error. had any lawyers calling yet." Enforcement so that they could appeal directly to it. Many Orange County voters never got the chance to appeal in any form. information sent by DBT, some of which was close to 20 years old, she said. many accused felons were identified by the central voter file in his county. have their names struck from the rolls. successfully appeal their designation as felons. which is then up to Florida officials to test and correct. personal profiles to unauthorized individuals. records -- that fail-safe check simply did not exist. Voter Integrity Inc. on April 1 for "innovative excellence [in] cleansing"
"scrub" their voting lists, too. donated $100,000 to the Republican Party. 2. Imagine that the self-declared winner lost the popular vote but won based on some old colonial holdover (Electoral College) from thenation's pre-democracy past. "The right to vote is preservative of all other rights." Thurgood Marshall -late Supreme Court Justice and veteran of the Civil Rights movement. delayed as long as 3 hours. The LA Times. not match official voting records. (The Los Angeles Times, 11/10/00). though the law does not require that the voters present both. (The Associated Press, NAACP). choices for president. Voters making mistakes and asking for new ballots were denied them. Beach County Elections Office (www.pbcelections.org). investigation into these civil rights abuses and take appropriate action. case because his son works for a firm that represents George W. Bush. Eugene Scalia said Sunday he is not working on the Bush case. this case, so it seemed unlikely he would do so this time. he believes Bush is likely to win his case after it is heard Monday. participated in a key Supreme Court vote in a Microsoft antitrust case. as noted in my email of 12/8/00 on judicial bias. three college campuses (Harvard, Yale, and U of Chicago). now one of the most right-wing members of the Supreme Court. (See the Washington Post, Dec. 12, 1986, p. A23). and grew its budget to $400,000 after only 3 years. Pretty good for a "student" organization! purity" of proposed Bush judicial appointees. that is funded by tobacco and coal companies, and by Microsoft. Stevens. The way the court actually split was quite simple. Bush Sr. as President or Vice President sided with Bush's son. Every other justice voted to continue the recount. activism", "overreaching," or "making new rules after the fact." Damned if you do; damned if you don't. A classic "catch-22"
objective is simply to put George W. Bush into office. (www.organizenow.net), the fiscal sponsor of this project. the reputation of the Supreme Court for years to come. the very justices who have repeatedly ruled in favor of states' rights â€"
calendar the day and a half lost to its stay. problem with these ballots is that they could not be read by machine. demonstrated, some of the ballots in question clearly show a vote for Mr.
Bush or Mr. Gore even though machines did not detect it. These next days promise to be filled with high drama and angry division. haven't but who I want to express myself to anyway. FAIR, and it strengthens democracy and the rule of law. Here's what happened: You'll recall that the original Fla.
statutes, which were enacted long before the present election took place. tilt the scales in favor of the man they want to win the presidency. history of this country since I got out of law school forty years ago. forwarded to whomever any recipient may wish to forward it to.Alan W.
Florida law is to count each ballot by hand. threatening public officials and demanding that the recount be halted. punched and kicked by the crowd as he made his way into the building. logistical directions for the "protest." I am with the eventual outcome. explicit goal of stopping votes from being counted. right-wing pundits that this in fact was merely "democracy" in action. polling places and intimidate latino voters). canvassing board into abandoning their announced recount of the votes. I fear that the cycle of violence will only get worse. Falls or Hoover Dam you generate power, alot of electric power. noncooperation helped bring down the British government in India. indifferent and hostile to those they do not know. Republican party at which we will shoot our arrow. machine in India, clogging its wheels and making it grind to a halt. the Republicans poor act, do not cooperate with them any longer.